For some reason it was insanely difficult to find high quality versions of posters for this movie. Pixar’s Cars franchise is like the pizza at a Chinese buffet – nobody is really asking for it, but a dedicated chef in the back keeps making it just in case someone gets a craving. As far as I’m concerned, Cars 3 is the only sequel in the Cars franchise. Cars 2 was somewhat enjoyable, but in a “There’s no substance here” kind of way. Had it been produced by any other company besides Pixar, expectations might have been set lower and the movie might have actually received a resounding, “It’s okay, I guess.” But as it stands, Cars 2 is something better left forgotten. So the burning question, of course, is whether or not Cars 3, much like Lightning McQueen in the movie, still has anything to offer. By now it should be no surprise or spoiler that the movie centers around Lightning regaining his reputation and struggling with his professional future following his crash during one of his races. Younger, more hi-tech cars are outperforming him and the other veteran racers, with most of his racing pals deciding to admit defeat and retire from the racing scene altogether. Lightning continues to push himself during each race in order to keep up with the new generation, ultimately resulting in disaster near the end of the racing season when he crashes while trying to catch up with new rival Jackson Storm. The racing world counts him out, but Lightning wants to prove he’s still got some gas left in the tank. Cars 3 is not the most exciting movie. Unless you genuinely find the racing scenes exciting, there is only one real “action” scene in the movie when Lightning finds himself trapped in a demolition derby. What the movie lacks in adrenaline it makes up for in powerful and emotional writing. This is a slow, reflective movie, and that works to its benefit. While the movie does not spend as much time as I would have hoped on Lightning regaining his confidence after his crash, it takes its time with other emotional subplots. Racing is Lightning’s life, and he does not know how to handle the idea of having that stripped away from him. At the same time, his new trainer, Cruz Ramirez (AKA missed pun opportunity), struggles with her life path not having gone the direction she desired. Children might go to this movie for the sheer novelty of a race car movie, but the reason they should go is so they can learn that life exists beyond failure and that there are always second chances if you just reach for them. The dilemmas facing Lightning and Cruz are ones that almost everyone will have to face at some point during life, and the movie does an excellent job of showing that while it is okay to feel sadness from defeat, you cannot let that sadness turn into despair. The movie is light on its supporting cast. Even rival Jackson Storm does not get much time to himself, similar to Chick Hicks in the first movie. The Radiator Springs crew is largely absent as well, making only a few brief yet important appearances. I for one am burnt out on Mater, so I’m glad he vanishes for most of the movie. Like the Minions, he works best in small doses. Sally’s lack of presence is a bit disappointing given her relationship with Lightning, but ultimately she would have had little to contribute to the plot anyway, so it’s probably for the best. The movie very much relies on the dynamics between Lightning and Cruz to tell its story. Lightning’s frustration at Cruz’s unorthodox training methods fuels the bulk of their interactions, leading to both of them opening up about their inner conflicts and emotions. Lightning is not the strongest lead in movie history, but his relatable motives in this movie and his relationship with Cruz keep the movie interesting anyway. It definitely doesn’t hurt that both Owen Wilson and Cristela Alonzo provide additional depth to the characters and their emotions through their brilliant voice acting. Cars 3 being a Pixar movie, it looks fantastic. No questions asked. If I have a solitary complaint, it’s that something just looks weird about the cars’ eyes. It’s never bothered me before, but they just look so flat compare to the vividness of the rest of the movie. Randy Newman provides the movie’s score to complement several incorporated songs from other artists. Like the movie, the score is quiet and poignant. There aren’t many gripping moments in either, but the whole ride is just so darn good regardless. It’s a great soundtrack that really helps carry the emotional weight of the movie. I only wish there had been a couple of tracks to stick with me like in other Pixar movies, but the gentleness of the music blended the songs with the scenes so well that I was not even consciously aware of the music most of the time, which means Newman did a superb job matching the music to the movie. It’s just lacking those riveting “Oomph” tracks that other scores have. Nobody asked for Cars 3. Hell, nobody asked for Cars 2. Okay, maybe a few people. But there’s no question that this is not one of Pixar’s better franchises. Still, it’s a merchandising behemoth, so a third installment is understandable from a business perspective. Cars 3 at least gave us what Cars 2 failed to deliver: a strong emotional narrative. The movie throws real-life problems at its motorized characters and uses them to show how adversity is the not the end. Lightning is fairly bland himself, but that probably works best when the movie is trying to illustrate themes that are relatable to most everyone. Cast introductions like Cruz and Smokey take a little time to warm up to, but they’re very much welcome additions to the Cars universe. 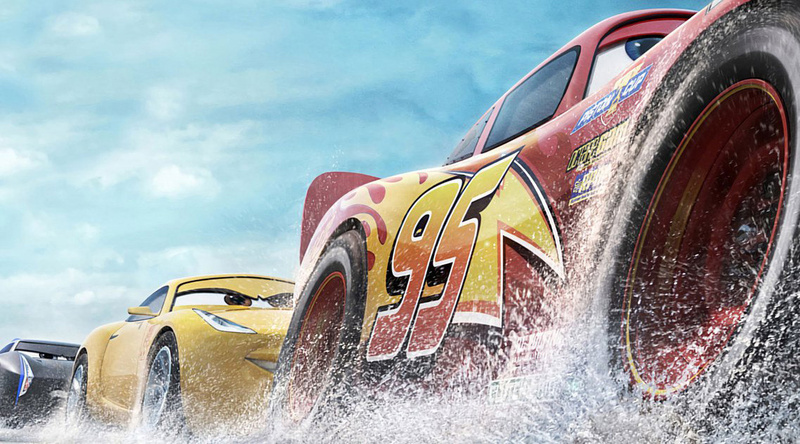 Cars 3 is better than anyone probably dared hope after Cars 2, but it could probably could have still benefited from utilizing its supporting cast a little more, namely new Rust-eze owner Sterling and Jackson Storm. Still, it’s a vast improvement over its predecessor and a solid film overall, even if it’s not one for the history books. Cars 3 is the closure the franchise needed and deserved, whether anyone really wanted this movie to happen or not. Final rating: Kachow!/10. Reviewer’s Random Comment: I can’t hold this against the movie due to its target audience, but the crash scene could have been a lot more dramatic. But I saw kids become distraught just from the trailer, so it’s probably best for the movie’s ratings that it kept things toned down.